The contestants in a handful of the most competitive general election races in Texas weren't in place until this week, when Tuesday's runoffs determined who'll run in November. Election phases can be like shampoo instructions: Lather, rinse, repeat. Tuesday’s primary runoffs set the table for November’s general elections and also the names on the ballot in the relatively small number of districts where a Democrat could overturn a Republican or vice-versa. Some contests are over now. In Cameron County, Alex Dominguez, a former county commissioner, upset incumbent state Rep. Rene Oliveira, D-Brownsville. With no Republican on the ballot, that effectively made Dominguez a future state representative. But incumbents in districts with the potential to flip from one party to another — state Reps. Victoria Neave, D-Dallas, and Paul Workman, R-Austin, to name two — now know whom they’ll face in November. Those incumbents are on political target lists — districts where the state’s legendary redistricting maps just aren’t strong enough to protect parties the mapmakers hoped to protect. Even a great partisan map has its weak spots. Neave’s district was drawn for Republicans, but political erosion there made it possible for her to wrestle it away in the 2016 elections. Now she’s defending, and on Tuesday, Republican voters nominated business owner Deanna Metzger for the job. Greg Abbott beat Wendy Davis in that district in 2014. Hillary Clinton beat Trump in 2016, while Neave was winning her first term. Though it’s on the Democratic target map, the Workman district is more partisan, in favor of the Republicans. Trump edged Clinton two years ago, and Abbott won handily. Like Neave, the incumbent found his November opponent in the runoff results; Workman will face real estate agent Vikki Goodwin. Most Texas Senate races were set in the first round of the primaries in March. But in Houston, attorney Rita Lucido won a Tuesday runoff and the right to challenge state Sen. Joan Huffman, R-Houston, in November. 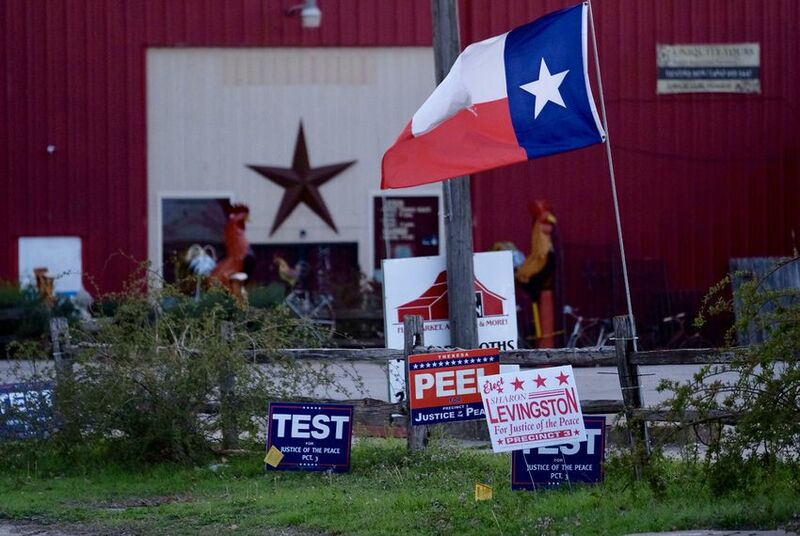 It’s a fairly reliable Republican district, and a couple of other Republicans in the Texas Senate are probably in greater danger in the general election. However, Trump’s narrow win — less than a percentage point — and the district’s changing demographics have made optimists of some Democrats. Three Republican congressional incumbents hold seats on Democratic wish lists and found out on Tuesday whom they will face. The most vulnerable, by the numbers, is U.S. Rep. Will Hurd of Helotes, in the 23rd Congressional District. He’ll face Gina Ortiz Jones, who won easily on Tuesday, in a district where the average statewide Republican candidate won by just over 1 percentage point in 2016. It’s a true swing district. In Dallas’ 32nd Congressional District, U.S. Rep. Pete Sessions will face Colin Allred who, like Ortiz Jones, handily won his runoff this week. Clinton beat Trump there by less than 2 percentage points in 2016; Abbott trounced Davis by 16 percentage points in 2014 in that district. It’s a tougher challenge, at least on paper, but the Democrats are hopeful that the president will have a traditionally dismal mid-term election. And in Houston’s 7th Congressional District, Democratic Party favorite Lizzie Pannill Fletcher dispatched Laura Moser on Tuesday, setting up a challenge to U.S. Rep. John Culberson. He’s the third of the three Texas Republicans whose voters switched sides in 2016, favoring both their Republican incumbent in Congress and the Democrat, Hillary Clinton, in the top race. But it’s generally red ground; Abbott defeated Davis in Culberson’s district by almost 22 percentage points — a little better than his statewide average. The big setup on election night, of course, was the race for governor. Former Dallas County Sheriff Lupe Valdez skipped past Houston entrepreneur Andrew White, setting up a general election that pits a Democrat from the state’s biggest reliable Democratic county against an incumbent governor with a record-setting $43 million-plus campaign account. If you think of the state as a political district, think of a red one. In 2014, the average Republican running statewide beat the average Democrat by 22 percentage points; in 2016, the Republican advantage was 14 percentage points. Even against that election history, the Valdez campaign could be advantageous to downballot Democrats. She’s well known in Dallas, where the Democrats have probably their best chances at winning back some legislative and congressional seats that belong to Republicans. And her candidacy could, if things go well, energize Hispanics — the fastest-growing group in the state’s population.